Have you ever wanted to rule your own kingdom? Of course you have. With Reigns you can do just that – while you stand in line to buy groceries. 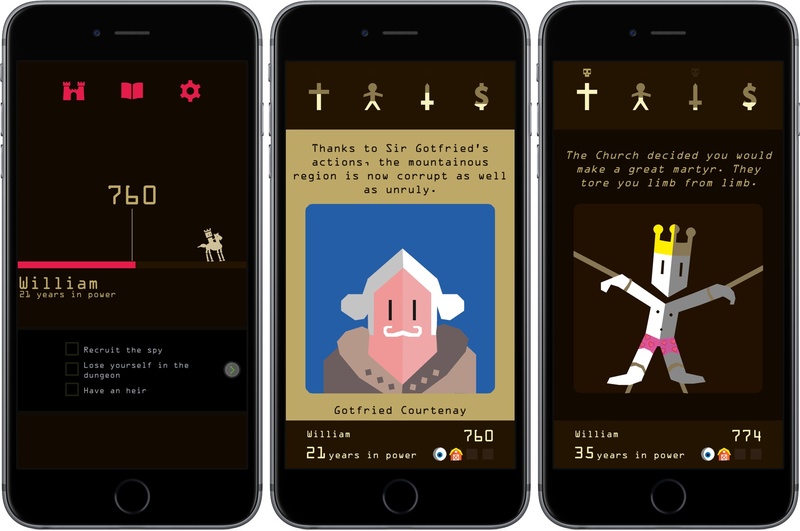 Reigns, an Apple Editor's Choice, is a card-based adventure game with an clever interaction model. Touch Arcade and Pocket Gamer liken Reigns to Tinder, which I get, but it’s also a little unfair because it ignores the depth and personality of the game that underlies the Tinder-like mechanics. As king, you are presented with a series of decisions in the form of cards that are brought to you by advisors and other characters. Each decision has only two options that you choose between by swiping left or right – hence the comparison to Tinder. But there’s much more to Reigns than just flicking cards. Every choice you make has consequences, some of which affect future generations, and it's not unusual for a decision to spin out of control quickly ending in your death. Each choice you make also has an impact on the strength of the church, your subjects, the army, and your finances, which are tracked at the top of the screen. As you play, you can swipe cards part way to the left or right to get a hint of which metrics will be affected by your choices. To survive, you must carefully balance each variable. Allow one category to get too high or too low and your reign will end badly. All reigns end eventually, but each time one does, you are reborn as a new king and given a series of goals like “Lose yourself in the dungeon,’ ‘Meet the devil,’ or ‘Try the blue one.’ Meeting goals unlocks cards and new aspects of the game keeping it fresh. There are also mini-games like dice and dueling scattered throughout Reigns. 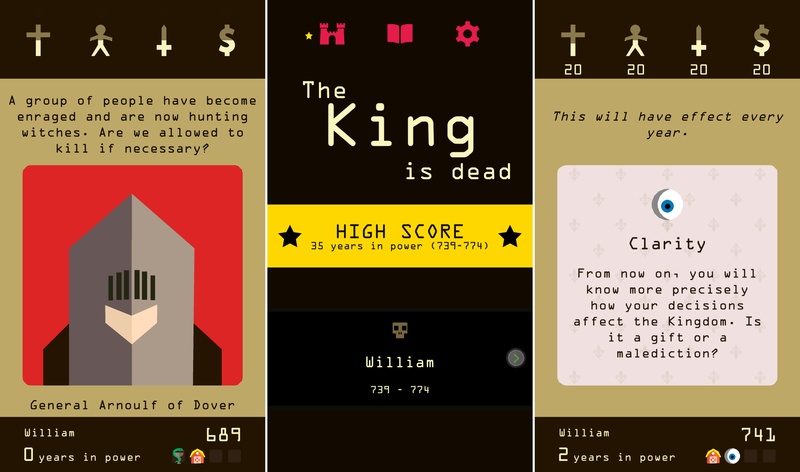 Reigns is perfect for mobile, though it is also available on the Mac via Steam. Swiping left and right to make decisions about your kingdom is quick and easy wherever you are. The combination of the number of cards, consequences that span generations, and need to balance multiple statistics adds an interesting level of strategy. But above all else, what has endeared Reigns to me most is that the artwork and questions are imbued with a sense of humor that gives Reigns a unique personality unlike any iOS game I have played recently. Reigns is available on the App Store for $2.99.